Janet and I have been to Bethlehem several times this year (3 or 4 times — I lose count). We want to share Christmas greetings with you from the place of Our Lord's birth. We had the wonderful opportunity of taking 50 pilgrims into Bethlehem a few months ago. I watched their emotion and wonder as they knelt down and touched the place where the Holy One of God first touched planet earth as a human being. It is beyond comprehension, but it is always worth trying. I watched as some pilgrims wrestled to grasp the depth of the mystery while others just wept for joy. The star you see to the right marks the actual place where Jesus entered the world, emerging from Mary's womb. When Jesus was born it was a marvelous night. Angels appeared, shepherds rejoiced, wise men arrived, King Herod was aggitated, and the site was remembered. Bethlehem was small. Just like any big event is remembered in a small town today, this was remembered — and not just for one week but for years and years. Origen (c. 185–c. 254) frequently resided in the Holy Land and wrote, “In Bethlehem you are shown the cave where he was born, and within the cave the manger where he was wrapped in swaddling clothes.” Jerome (c. 345-c. 419) later described the grotto over which the Emperor Constantine had built a basilica. Imagine, in the early years after the miraculous birth pilgrims came from around the world to see the place. The first residents of Bethlehem knew where the birth took place and as pilgrims and curious people began to arrive over the months and years and decades, the site became well known — a popular attraction. It still is today! And thanks to those who venerated this place over the centuries, we know where it took place when we visit in our time. I wrote an article on why Holy Ground is so special. When we walk through Bethlehem — with all its struggles and conflicts between Jew and Palestinian, Christian and Muslim — there is still a palpable sense that there is no other place on earth like this hillside. 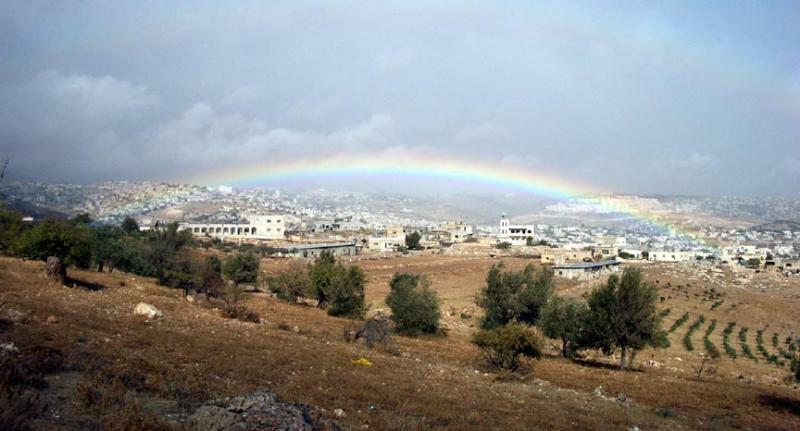 The rainbow is a sign of God’s promise to all mankind given to Noah after the flood. It was a promise to never wipe out humanity again through a flood. I was reminded of that promise when I took this picture of the rainbow (click on the picture for a larger image). I took the picture on our last trip to Bethlehem while filming our next documentary "David & Solomon: Expanding the Kingdom". We rented a flock of sheep in the countryside outside Bethlehem. It rained pretty hard and the result was this amazing rainbow which hung over Bethlehem for over an hour. The left end rests over the Church where Jesus was born and the right end rests over Shepherd's Field where the angels announced the good news to the shepherds. Not only has God promised not to wipe out humanity again with a flood but he has promised to SAVE humanity, this time through a flood of water and blood that poured from the side of Jesus Christ his Son. It was in this place in Bethlehem – the House of Bread and the home of David the shepherd – that the Bread of Life and Lamb of God was born to save and feed those in sin and starving for the eternal life of God. Nazareth is where God first became man; Bethlehem is where that God-man first touch planet Earth with his own flesh. The star in the picture above marks the spot where it happened two thousand years ago – but that life still throbs in our beings to this day – especially this day! If you haven’t seen this movie . . .
. . . run out and find a copy and watch it. I finally had a chance to watch it last night — and I highly recommend it. It is a tough movie to watch at times and it is in German with English subtitles — but it was exceptional. I will watch it again this week. The Ninth Day is now in my Top Ten movies. It is an extraordinary film about a Catholic priest in Dachau who must make a torturous decision. I will say no more so I won't ruin it for you, but as the days progress from the First Day to Ninth, the tension story reveals itself and the tension builds. It will make one proud to be Catholic.